“Here is the boy, drowning. When Seth enters the water and the cold consumes him, he believes that that is it. His life is over. But when he wakes up naked, bruised and alone, outside his childhood home, he finds that that was not all there was, life isn’t quite as over as he imagined. Now Seth is walking the streets of his childhood town, deserted, covered in dust and overgrown with weeds. How can this have happened? Where is everyone? and most of all why does he dream of memories that hurt him the most? This book is actually bonkers, in an awesome way. A slow start made me wonder if anything would happen but once it got going I realised that the entire book is slow and thats for a reason, its designed to make you think whilst you’re reading, make you wonder if there is indeed more than this and how Seth has come to be in this place he used to regard as home. 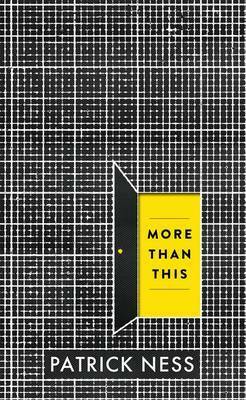 There were a lot of mysteries in More Than This and to be honest I loved the way they all unfolded, especially about Seth’s brother and his problems. The biggest mystery of all is obviously what the place is and why Seth is there but I think thats a more personal one for the reader to unfold themselves and I think I got it… maybe. The book is quite philosophical in that it keeps reminding us about the possibilities of life after death, of how real the world actually is and what it means to exist. There is an existential crisis going on in Seth’s mind for most of the book and I don’t b;lame him but he was a bit self focused through a lot of it, which he needed to snap out of. I like the reflection on real life that has as well and I thought it was a good way of having people relate to Seth as we can all be like that sometimes! My feelings about More Than This will take days, if not weeks, to fully sink in so I am going to leave my review here. I really enjoyed it but its one of those books that will make you carry on thinking and I loved it for that, yet others may not. I would definitely recommend it though, especially if you are a fan of Patrick Ness as I am. More Than This was published on September 5th by Walker Children’s Books. My copy was sent to me from the publisher in exchange for an honest review. I really have to find More Than This, I don’t think I’ve seen a single negative review for it and I loved Patrick Ness’s other books so much that I don’t see how I could fail to enjoy this. Great review!